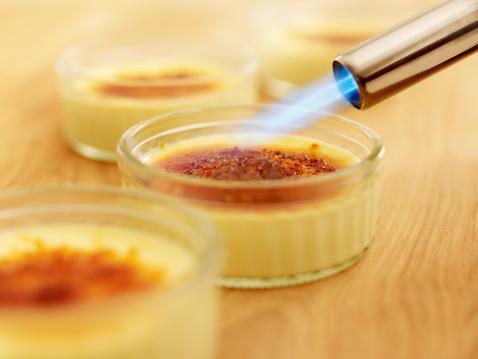 The history of crème brûlée is complicated and hotly debated. Chefs in England, Spain and France all claim they created the first version of this delicious dessert. Food historians note that custards were popular in the Middle Ages, and recipes for custards circulated widely through Europe. So it's almost impossible to find the first recipe for this dessert. The question is: who was the first to caramelize the sugar on top of custard and to serve it as a dessert? Lore says that sometime during the 17th century, a young college student supposedly presented the kitchen staff with a new recipe: a creamy unsweetened custard with a caramelized sugar topping. But this new dessert was spurned by the staff until the student became a fellow. With his credibility established, others in the kitchen took interest in his creation. It was named "Trinity Burnt Cream," and its popularity grew. While it cannot be proved that Trinity College in Cambridge actually invented the sublime treat which they also note as unlikely, their version of crème brûlée is a staple on their menu. The kitchen staff has an iron with the college crest that is used for making the burnt topping. Brits vehemently deny that Trinity Brunt Cream and crème brûlée are even the same dish. While the French version is very sweet, British Trinity Cream is unsweetened, and the sugar topping is thicker and crustier. The Spanish claim their version of crema catalana is the true predecessor of crème brûlée. 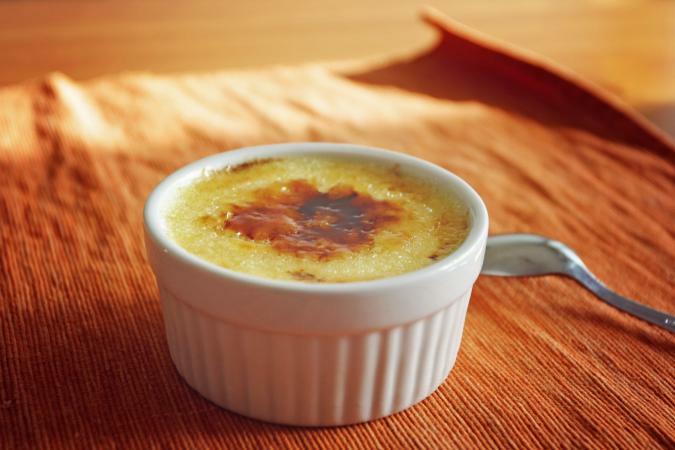 However, creama catalana is not baked in a water bath, or bain marie, as crème brûlée is. Crema catalana is served on Saint Joseph's Day (March 19th). Most people assume that crème brûlée is a French dish. After all, the name is French. However, the name crème brûlée didn't become popular until the 19th century. Crème brûlée is probably just another version of a custard recipe that was passed around through the Middle Ages. The French version of this dessert is baked in a pan of water and is chilled for several hours. The custard is sprinkled with sugar and then caramelized with a kitchen blow torch and served quickly, so the contrast between smooth and cold custard and crunchy and hot topping is preserved. Butter 4 (6 ounce) ramekins or oven proof custard cups with unsalted butter and set aside. In a large bowl, beat the egg yolks with the whole egg until smooth. Strain this mixture through a sieve into another clean large bowl. Stir in 1/2 cup sugar, vanilla, and salt with a wire whisk until the sugar dissolves. Place the ramekins into a 9" x 13" glass baking dish. Carefully pour boiling water around the ramekins, being careful not to get any water into the custard. Bake the custard for 30 to 40 minutes or until the custard is just set. Carefully remove the ramekins from the pan and set on a wire rack. Let cool for 30 minutes, then cover and refrigerate the custards for at least 4 hours. When you're ready to serve, take the ramekins out of the fridge and place them on a heatproof surface. Uncover and sprinkle each custard evenly with 1 tablespoon sugar. Using a kitchen torch, brown the sugar, moving the torch evenly over the top of each custard. Be careful not to burn the sugar. Serve immediately. Each diner uses a spoon to break the hard sugar top and enjoy the custard and crisp topping together. In many ways, crème brûlée is a timeless and classic recipe. From its predecessor of the sweet custards of the Middle Ages, to the variations of today, this popular dessert can be modified in many ways. Zest of orange or lemon is a popular variation, usually added to a sweeter custard. Vanilla bean, cocoa, or even coconut extract are used in some recipes. Fresh fruit is a sometimes welcome addition to this dish. Raspberries or blueberries are delicious with the rich custard. Liqueurs can be added. Add 1 to 2 tablespoons of Grand Marnier, Amaretto, Kahlua, or Irish Cream to the custard before baking. Bittersweet grated chocolate is sometimes sprinkled on top of the custard before the sugar topping is added. The basic definition of a crème brûlée is a smooth and creamy custard topped with caramelized sugar. However, the type of sugar or other topping used, and the way it is caramelized can vary. Sometimes liquor is adding to the topping and lit on fire for a dramatic presentation. You can place the custards on a baking sheet and broil the sugar topping for a few minutes instead of using a blow torch. You can use brown sugar in place of the granulated sugar for the topping. The world may never know who invented crème brûlée or where it came from. However, everyone can agree that this delectable dessert deserves a place in cookbooks around the world. Serve it at your next dinner party. It's the perfect make-ahead dessert!